When he came to play he couldn’t get near our dogs as his skin would break out, so we made him a small space at the bottom of our garden. 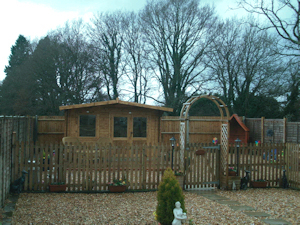 At Christmas we made it bigger and since then I have had a lovely large Summerhouse put up and have made a memorial garden. Its called Charlie`s Garden no dogs allowed. I am hoping to hold gatherings after the opening of the garden. Afternoon teas with bubbly, cheese & wine Parties. Wine tasting evenings. All money`s raised from these get together`s will all go into Brain tumour research. Also new and old friends will have (hopefully) had a good time (we just now need some good weather). 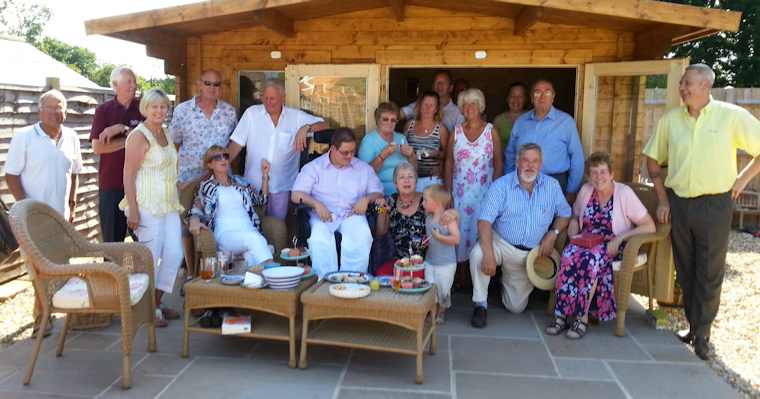 Friends and family at the opening of the garden – July 2013.